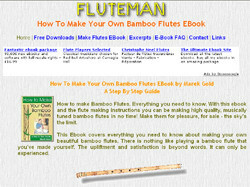 Blurb: New Age and How To Make it EBooks plus How To Make Your Own Bamboo Flutes. A complete step by step guide on making your own Bamboo Flutes. All the ins and outs. Suitable for the beginner flute maker as well as the advanced. Models covered include the Shakuhachi, Side Blown, Native American Flute, Bamboo Sax and Recorder. This Ebook covers everything you need to know about making your own beautiful bamboo flutes. There is nothing like playing a bamboo flute that you've made yourself. The upliftment and satisfaction is beyond words. It can only be experienced. How to make Bamboo Flutes. Every thing you need to know. With this ebook and the flute making instructions you can be making high quality, musically tuned bamboo flutes in no time! Make them for pleasure, for sale - the sky's the limit. How To Make Your Own Bamboo Flutes is suitable for the beginner as well as the experienced bamboo flute maker. It progressively and logically covers critical aspects of bamboo flute making right from selecting and harvesting the bamboo to the final finishing of the instrument.